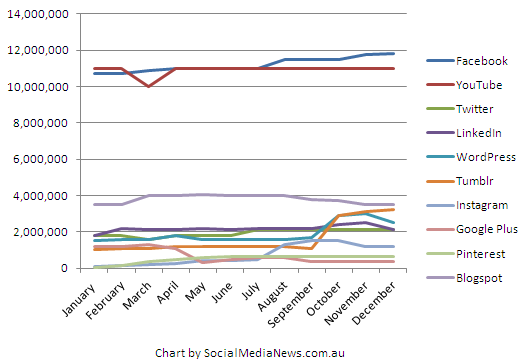 Over 2012 we have seen Australians further embrace Social Media across all spectrums of society. Not just individual users, but companies, government departments, organisations, not for profits, industry associations, politicians, celebrities – all sorts of people and entities are now using social media. In fact over half of the total Australian population is now signed up to Facebook and growth is still occurring. We have also seen new networks explode, such as Pinterest and Instagram, while existing international networks such as WordPress and Tumblr have seen significant growth in Australia specifically. Google also decided to launch their own social layer across their suite of products – Google Plus. This is a major battle for Google and only time will tell if this product becomes truly successful. We decided to look at the major networks being used in which we can get reliable Australian data. Recently Google retired their Adplanner tool (to much outcry internationally), and as a result we are now looking at leading international web analytics firms Quantcast and Comscore. These firms receive official user numbers from the social networks themselves which includes localised Australian user data numbers. We have charted out the growth of major networks we are tracking from our monthly social media statistics and also updated figures from Quantcast and Comscore. What are we watching in 2013? 1. 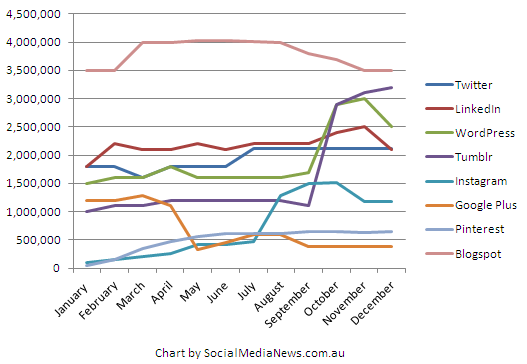 What is the true number of Australian monthly active users on Google Plus? Will this network get real traction in Australia? 2. We want to hear from Twitter updated global users numbers (or Australian user numbers – but they have never released specific numbers for Australia). It has been several months since Twitter have given any indication on global monthly active users. 3. Instagram is still growing strong in Australia and internationally. 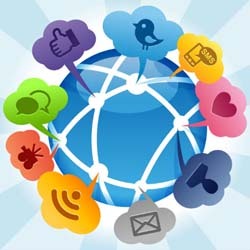 In 2013 we expect to see even more growth as this becomes one of the largest social networks in the world. 4. Tumblr growth has been exploding around the world, including Australia. Will they knock long time blogging platform WordPress off their top spot? 5. In terms of content consumed we expect to see a further push towards pictures and video – as we’ve seen massive growth from Instagram and other visual networks like Pinterest. We also came across a product called Keek which looks to be a ‘Video Instagram’ – will it catch on globally? Maybe as mobile data speeds improve and become cheaper. Any trends or things we should be watching in 2013? Let us know. As always – you can keep an eye on our monthly social media statistics that again we compile using data from Google, Alexa, Comscore and Quantcast.